Amidst the half-dark New York City skyline, Sandy gusted in with winds over 85 miles an hour and hit the shoreline with a 13-foot storm surge – flooding streets, sidewalks, businesses, subways, tunnels, and homes. 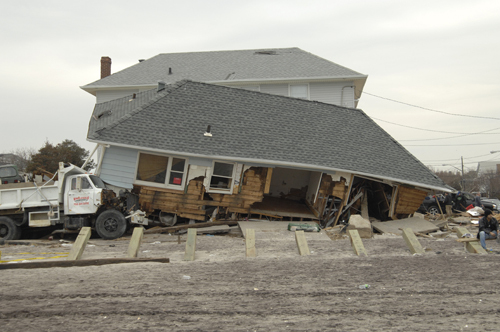 For some, Sandy came and went without much damage. Incredibly, many places in New York City remained untouched by the storm. Belle Harbor was not so lucky. 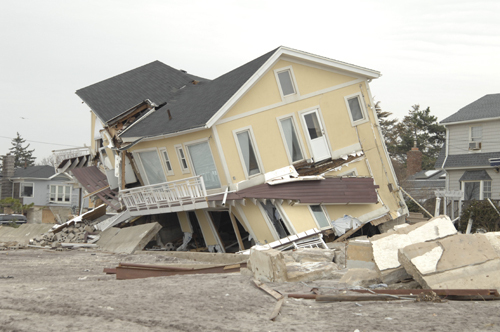 In one of the hardest hit areas in New York City, Belle Harbor, residents faced utter destruction from the storm. Fire hurled through the sky as flood water rushed in – filling basements and pouring in through doorways. Families were literally trapped between fire and water debating whether jumping into the six-foot rushing rapids or remaining in their homes would be the safest option. 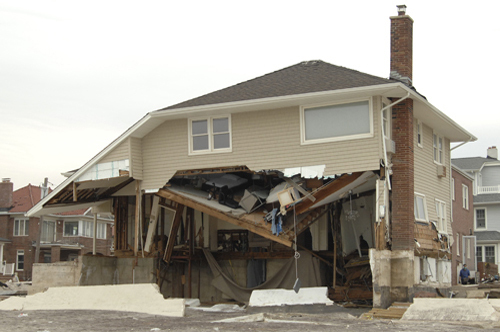 After the winds had calmed and the flood waters receded, Belle Harbor residents awoke to ruin. Nearly two weeks after the storm, the Magpies packed vans full of shovels, cleaning supplies, food, water, and people in an effort to clean up Belle Harbor. We joined throngs of cars, military vehicles, and dump trucks in the two-hour plus traffic jam out to the Rockaway Peninsula. The streets were filled with people – some with shovels, others with food. We joined the groups of residents and volunteers and started to remove the debris and sand from front and back yards using whatever we could find – wheelbarrows, buckets, trash cans, and even a sled. The families who had lost so much in the wake of the storm were happy to share their stories, and we were happy to listen. 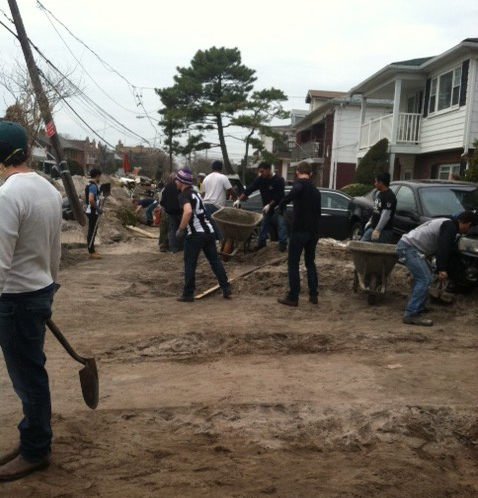 Even though the destruction that Sandy caused will remain for months, possibly years, we came together to do what we could. That is what our team is – we are more than just a collection of individuals, the Magpies are a family. During these times of tragedy, we are more than just a collection of boroughs or neighborhoods. We unite as a city – as New York City – and work toward restoring our home. The work is hardly done in Belle Harbor nor in many other waterfront neighborhoods. 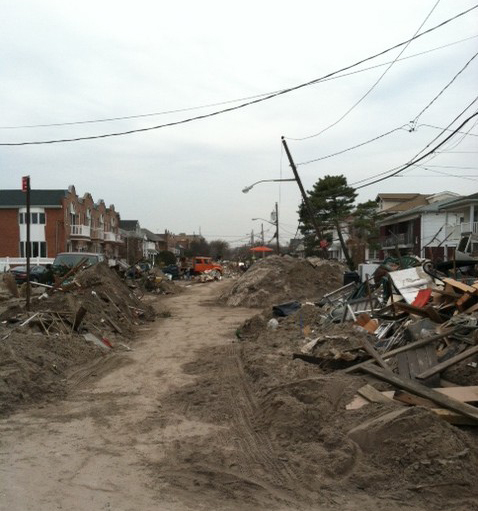 But on this day as we said goodbye to Batty’s neighbors, whose yards were now clear of sand, we felt hopeful. Despite the destruction, these people’s resilience and optimism remain strong. 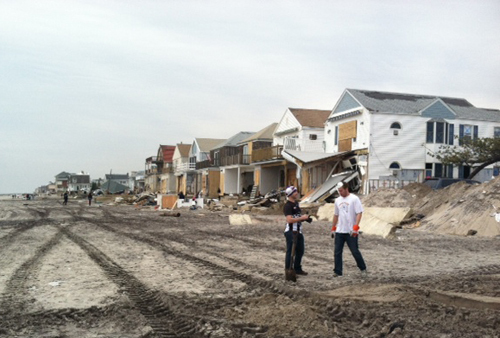 You can help the residents of Belle Harbor, Queens by donating to the Graybeards, a local nonprofit in Rockaway.